Graham Spray Equipment, whose custom spray rigs are used in the lawn care industry, as well as in pest control and agricultural applications, announces the addition of three new tools for lawn and tree care professionals. Graham Spray Equipment, whose custom spray rigs are used in the lawn care industry, announces the addition of three new tools for lawn and tree care professionals. Beginning this year, the company’s newly revamped online catalog of parts and tools will include a professional tiller, aerator, and a deep-root fertilizer gun, as well as enhanced descriptions of all the featured items. The GSE Tiger Tiller is designed to rough up the ground for reseeding bare spots in established lawns and seeding new areas. 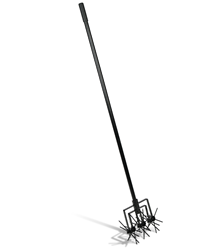 It features all-steel construction, three 12-pronged rotating heads, and a foam handle for comfort. The GSE Trident is a coring-type aerator designed for tight spots that cannot accommodate a full-sized aerator. Three steel prongs penetrate dense, compacted soil, removing 3- to 4-inch plugs to let air, water, and nutrients travel to the root system of turf. Like the Tiger Tiller, it features all-steel construction and a foam handle for comfort. The GSE Deep Root Fertilizer Gun is designed for surface spraying or root feeding trees and shrubs to a depth of 6 inches. A spring-loaded splash guard prevents liquid fertilizer from spraying back up as its injected into the ground. The GSE gun is compatible with pressure systems up to 600 psi and can deliver up to 4 gallons of fertilizer per minute. The Tiger Tiller and Trident come with a lifetime warranty and all of these products can be ordered through Graham’s online catalog, at http://grahamse.com/cart/parts, or by phone, at 800-543-2810. While Graham carries more than 5,000 components that customers need for their spray rigs and their work in the field, their online catalog features only the most frequently requested items, making it quick and easy for customers to find what they need. Any items not in the online catalog can be ordered from Graham by phone. The company strives to ship all orders the same day and will talk customers through most installations over the phone once the part is received. To learn more about any of Graham Spray Equipment’s spray rigs and services, call 800-543-2810. About Graham Spray Equipment: Since its founding in 1979 as Graham Lawn Equipment, Graham has been custom designing and building hardworking, long-lasting spray equipment. Graham spray units are used for lawn and tree care, pest control, and agricultural applications across North and South America. Graham prides itself on delivering the quality equipment and full array of services their customers need to be successful.